Responsible Modern Offshore Drilling. Except When It Isn’t. Ah. So this must be the Responsible Modern Offshore Drilling we’ve all been hearing so much about. In magazines. In the newspapers. On the radio. On TV. On social media. Pretty much everywhere you look. 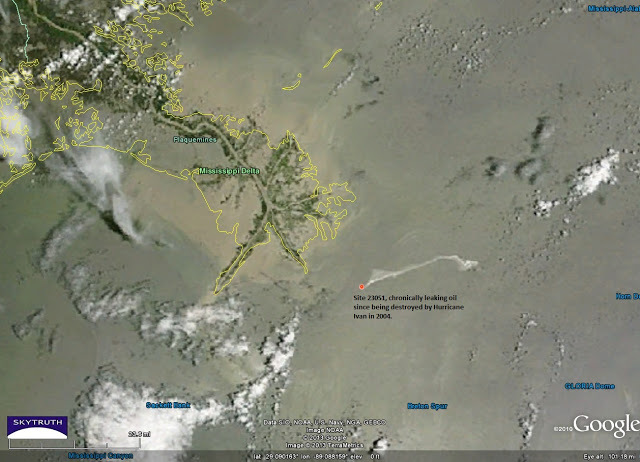 MODIS satellite imagery taken Tuesday (June 18, 2013) shows a slick 32 miles long emanating from the Taylor Energy site, which has been reliably oozing oil into the Gulf for more than 8 years now. Strangely, there appears to be no action from the responsible party, industry, state or federal authorities to bring this ongoing travesty to a close. It’s likely this chronic leak has been generating tarballs that have been coming ashore on the Louisiana coast for years, well before the catastrophic 2010 BP / Deepwater Horizon spill. Maybe the powers that be in Louisiana and in Congress have decided to look the other way and keep their mouths shut, while the oil and gas industry spends hundreds of million of dollars per year on advertising and lobbying to convince the American people that oil and gas production is squeaky-clean and risk-free. Maybe it’s time to spend those millions to clean up the real-life problems, instead of trying to convince us that they don’t exist, because the Gulf Monitoring Consortium and others are working hard to ensure this stuff can no longer be hidden from public view. Why not start here? Eventually the people of Virginia and North and South Carolina who are being wooed by the promises of offshore drilling jobs and cash might begin to pay attention to industry’s inaction and politician’s lack of concern here in the Gulf. They just might have second thoughts about drilling when they imagine a Taylor-like scenario unfolding in their waters, and a steady stream of tarballs washing ashore for years in Virginia Beach, or Nag’s Head, or Myrtle Beach. Or a slick like this right off their coast, day after day after day after….. Detail from MODIS/Aqua satellite image taken June 18, 2013 showing 32-mile-long slick apparently emanating from site of chronic Taylor Energy oil leak. Clouds and their matching shadows are distinctly different in appearance from the shadow-free slick on the water. Detail from image above, showing our measurement of the slick (80 square kilometers / 29 square miles). Assuming an average thickness of 1 micron (1/1,000th of a millimeter) this slick holds 21,120 gallons of oil. https://skytruth.org/wp-content/uploads/2013/06/SkyTruth-Taylor-MODIS-18june2013-1.jpg 961 1600 John Amos /wp-content/uploads/2016/08/test_logo.png John Amos2013-06-20 16:19:002019-02-15 11:40:41Responsible Modern Offshore Drilling. Except When It Isn't. 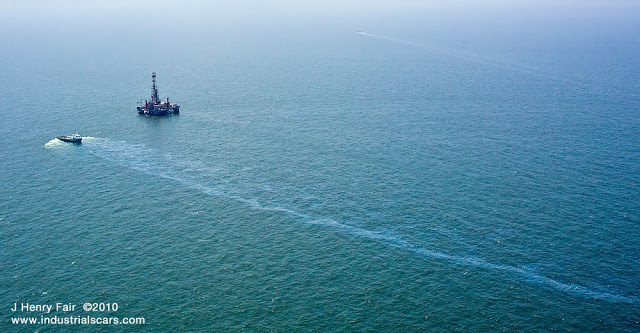 We here at SkyTruth actually look forward to the day when we can look at satellite images from the Gulf of Mexico and NOT see any human-caused oil slicks. Yesterday, unfortunately, was not that day. 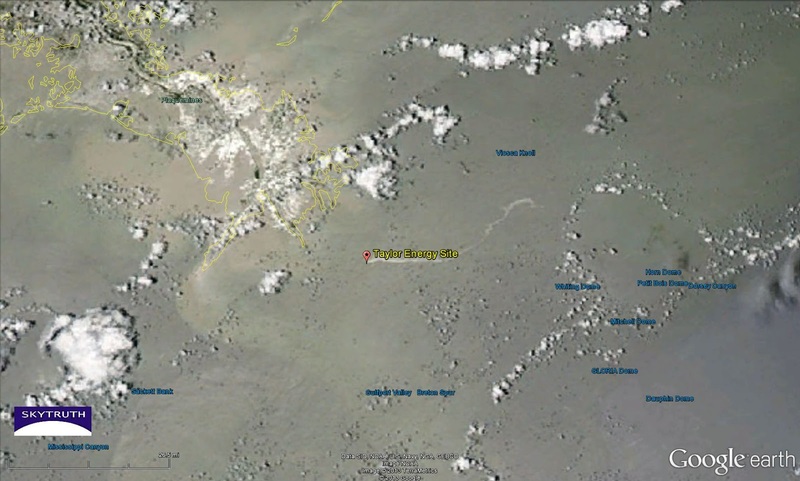 Quite the contrary, on yesterday’s MODIS Terra image we can plainly see another slick emanating from Taylor Energy’s site 23051. We’ve done tons of blog posts on this chronically leaking site, and sadly, we will probably do many more until Taylor or their partners gets this thing fixed. MODIS Terra True Color satellite image taken on 6/17/2013 at 1:50 pm local time. Location of chronic oil leak at Taylor Energy site shown by red dot. Slick measurement shown by yellow line. Scattered clouds and cloud shadows to left and right. Unlike the clouds, the slick lacks a corresponding shadow. Yet Taylor’s required daily report to the National Response Center (NRC) for June 17th states there was a visible slick only 10 miles in length a few hours earlier. Assuming their description of the slick is correct, and assuming an average slick thickness of 1 micron (1/1000th of a millimeter), that represents a total volume of almost 65 gallons. But that’s 45 times more oil than Taylor reported for this slick – Taylor reported a spill volume of a mere 1.43 gallons. 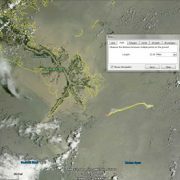 MODIS Terra True Color image shows a 22-mile-long slick apparently emanating from Taylor Energy’s chronic leak site, spilling oil continuously since September 2004. As we reported in our blog of Monday, June 3, NOAA has begun to look at satellite images of the Taylor area and reporting what they see. Their report to the NRC from yesterday states pretty much what we see on this MODIS image, a slick extending east from the site for a distance of 39km (24 miles). 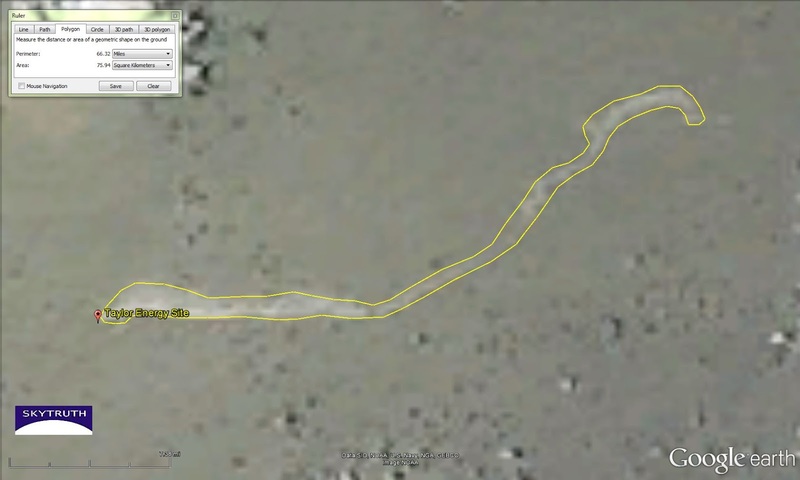 NOAA also reports the slick covers 88km2 (we measure it to be about 56km2). Applying our “rule of thumb” assumption that the slick must have an average thickness of at least 1 micron, that amounts to a volume of 264 gallons per km2 — in this case between 14,784 and 23,232 gallons of oil on the water on June 17. That’s 10,000 to 16,000 times larger than Taylor’s official estimate of 1.43 gallons. These wells have been leaking for almost nine years. Why aren’t Louisiana’s politicians hopping mad about this? 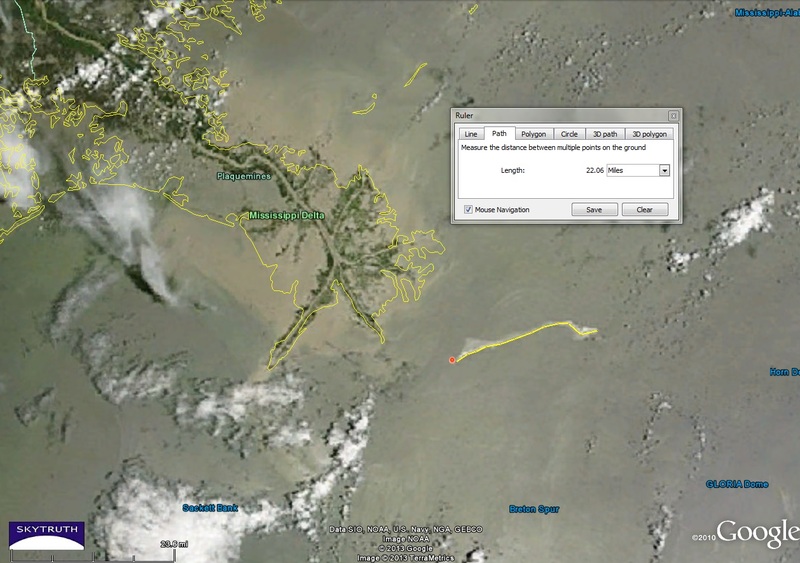 Remember that strange, persistent little oil slick about 12 miles offshore that SkyTruth discovered on satellite imagery during the BP oil spill in 2010, that was NOT related to the BP / Deepwater Horizon disaster? 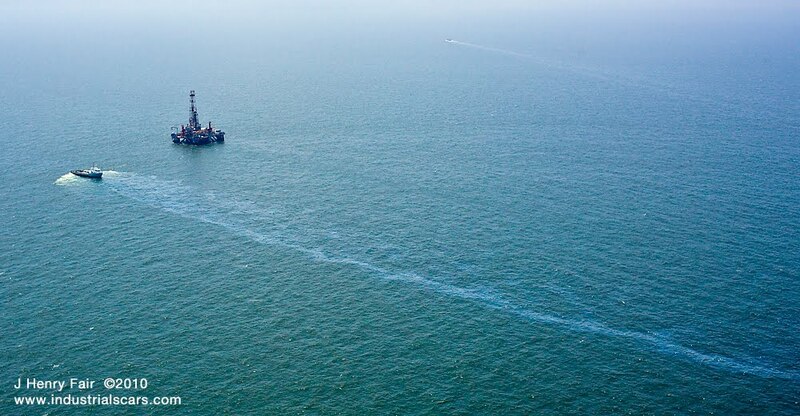 Remember how SouthWings flew photographer J. Henry Fair out there and came across a deepwater drill rig with a miles-long oil slick next to it? 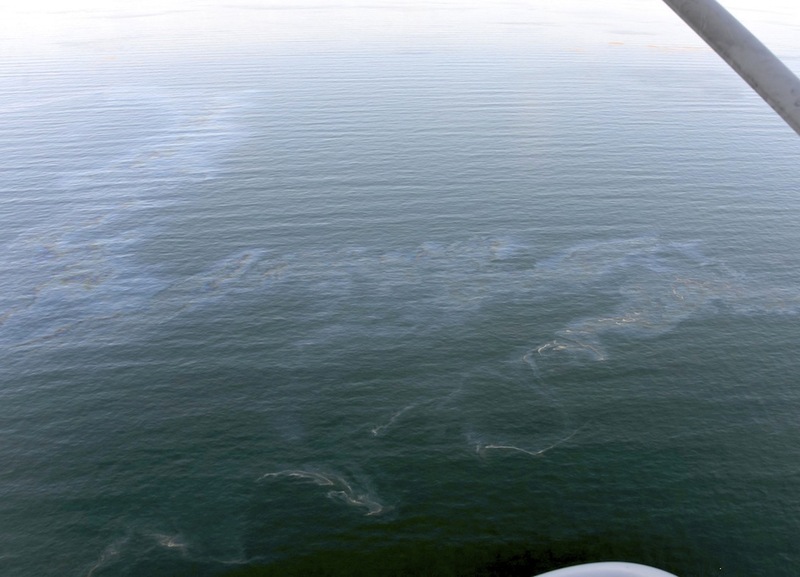 Oil slick at the Taylor Energy chronic leak site in Gulf of Mexico, June 5, 2010. 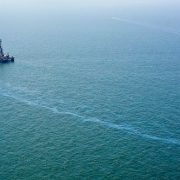 When we published this, an interesting story emerged: we had found a chronic, continuous oil spill in the Gulf emanating from oil wells that were serviced by a platform at this location. “Platform 23051” as we called it (because that’s how it was identified by government data), no longer existed: it had been hit by a seafloor mudslide triggered by Hurricane Ivan waaaay back in September 2004. That’s right, six years earlier. And the damaged wells, now buried under the mud, were being slowly found, re-entered and plugged with cement by their owner — an LLC named Taylor Energy Company — using a leased drill rig called the Ocean Saratoga. The rig disappeared for a while, then re-appeared in November 2010. It was still on the scene in March 2011, when Greenpeace flew over the site and took some photos. 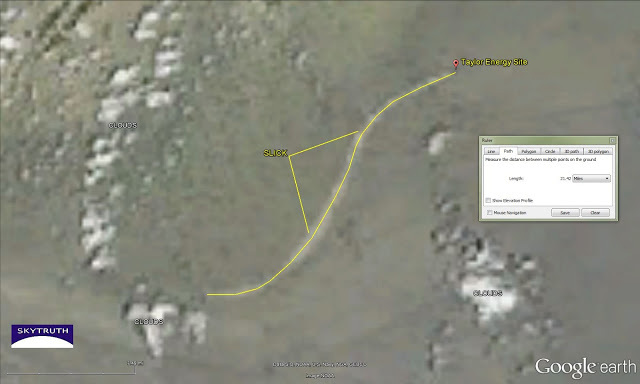 But we had indications from AIS vessel-tracking data that the rig had departed by June 2011. Periodic aerial overflights conducted by Gulf Monitoring Consortium and On Wings of Care, and radar satellite images acquired since June 2011, have shown no rig working to plug the wells since Ocean Saratoga’s departure. The May 2013 status report from Diamond Offshore shows the rig is contracted to work elsewhere. One thing, however, has remained constant at the site: it’s still leaking oil and forming a persistent, miles-long slick that is routinely visible on satellite images. Occasionally it reaches out more than 20 miles from the source. Taylor is required to report the size and location of their oil slick to the Coast Guard’s National Response Center on a daily basis. We’ve compiled all of their reports, as well as our own observations from overflights and satellite imagery. 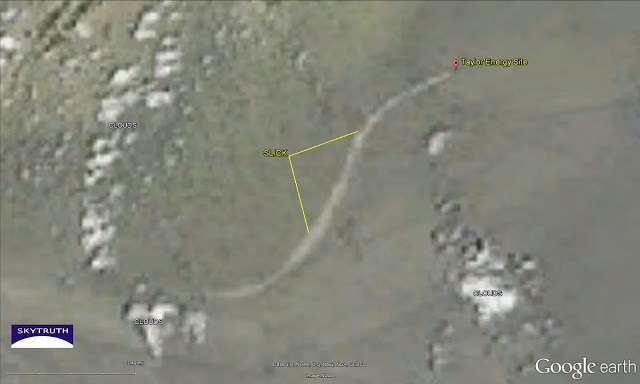 What we see on satellite images consistently contradicts Taylor’s own reports, suggesting they are systematically and significantly underreporting the size of the slick. And our analysis shows that the total spill from the Taylor site may have exceeded 1 million gallons by February 2012. In 2013 the satellite experts at NOAA began to report their analyses of the Taylor slick to the NRC as well (the first report we noticed from NOAA came on April 7). They, too, are reporting slicks significantly bigger than what Taylor is reporting. The latest example: on June 1 at 9:00am, Taylor reported a slick 200 feet wide and 6.5 miles long. But NOAA reported a slick 1 mile wide and 20.2 miles long on a satellite image taken at 11:45am, less than three hours later. NOAA’s slick is more than 80 times bigger than what Taylor reported. And if we assume the slick is, on average, only 1/1000th of a millimeter (1 micron) thick, that amounts to at least 13,800 gallons of oil on the water. Yet the federal government has publicly stated that the leaking wells cumulatively spill only about 14 gallons per day. 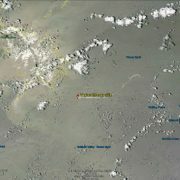 Detail from MODIS/Terra satellite image taken at 11:45am on June 1, 2013, showing slick (bright line) apparently emanating from site of chronic leak since 2004. Measurement shows slick extends more than 21 miles from the source. Something’s fishy here. But no matter whose numbers you believe, one nagging question is begging to be answered: When are these wells going to be permanently plugged? As time goes by, it looks like the answer is “never — we’re going to let them leak until the reservoir effectively bleeds out.” How can this be acceptable to federal government regulators and the politicians of Louisiana? Those rushing to embrace drilling in the waters off Virginia, Alaska and elsewhere in the US might want to slow down and take a good hard look at this ongoing travesty in the Gulf.